"I use the term beautiful work broadly: ...Always, in all subjects, there is a quest in my classroom for beauty, for quality, and we critique all that we do for its level of care, craftsmanship, and value." "Beautiful work is the idea that schoolwork is about the process of producing something beautiful. In that process learners learn the lesson. It is beautiful not because it's neat or colorful or artistic, but because it represents the very best work of that individual, with the assistance of their classmates along the way. Schoolwork isn't something that we just have to get done and move on. It's an iterative process and our learning is in those several iterations." School work should feel just as valuable and worthwhile to students as work feels for adults in pursuit of their careers and/or passions. Valuable learning does not happen entirely in collaboration with others, but it also does not happen entirely in isolation as an individual. The feedback we get from others is just as important as the reflections we do on our own. Learning is in BOTH the process and the product. We learn from making mistakes and finding out how to fix them. We also learn from feeling the satisfaction of creating a product that we are proud to share. Near the end of his email to me, Glenn wrote, "This is what genuine and effective Project Based Learning looks like." 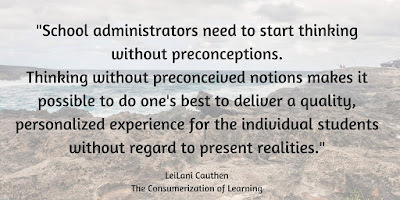 It just so happens that, as part of my preparation and planning for our upcoming in-house school conference, I was reading articles and watching videos about some of the hottest education theories including PBL. I came across this video from Edutopia on rigorous PBL and it really captured the elements of beautiful schoolwork for me. Besides the aesthetics, what would be the elements of beautiful schoolwork in your classroom? How would your students, their parents, and the community beyond your classroom know that your students' learning is beautiful? I've learned that those are unfinished statements. 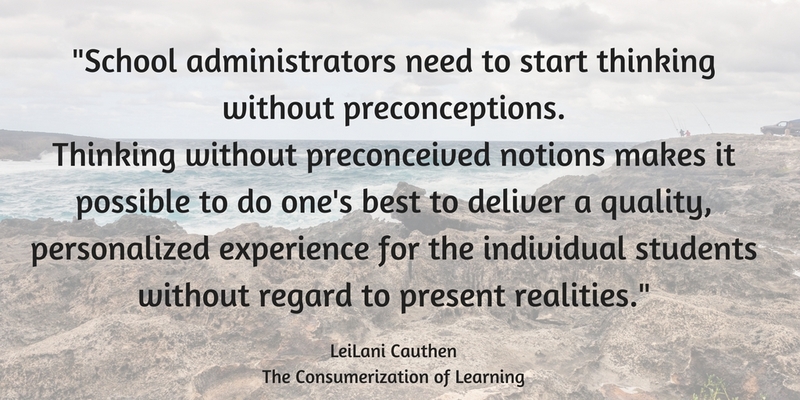 The sentiment they express is not the vision or leadership that educators and learners need. I'm shifting my perspective. Here's why. Each of these 4 statements should be finished with phrases that include the words "student" and "learning" in some way. Education is a moving target. As soon as a district team writes a goal, that goal is both outdated and worth pursuing. It is outdated because district leadership needs to achieve that goal while planning for what comes next. It is worth pursuing because it is a necessary and big step along the journey of progress toward the best possible student learning. While it is essential for education leaders to celebrate the good work that is being done, it is just as essential for those leaders to communicate an inspiring vision that includes tangible benchmarks to measure progress, especially when it comes to measuring the value of any type of technology in schools. Cauthen's advice for each stage is worth considering. Be aware of where your school is, but remain focused on where it needs to be. Her vision for a more personalized (a.k.a. consumerized) education experience for students and teachers is exciting. 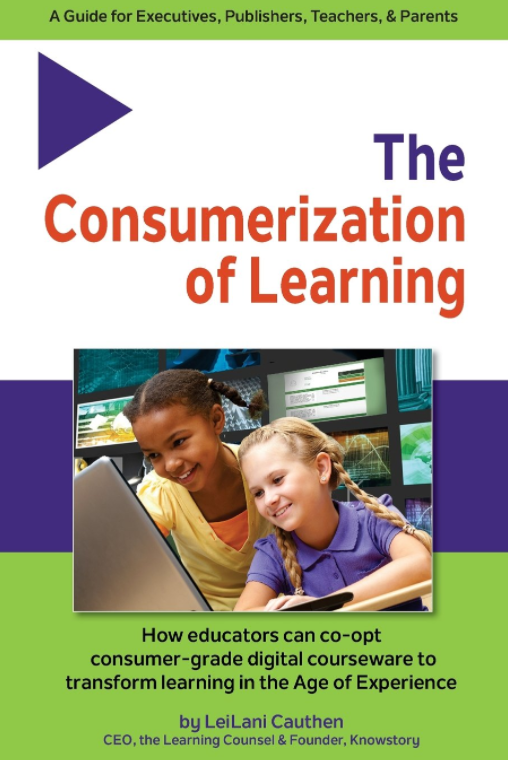 Educators may not agree with everything in this book, but it is a very good thing that these ideas are now part of the discourse about how public education needs to change. Access to our screens – and the information and connections those screens make possible – is an essential part of our personal, academic, and professional lives. But the amount of time we spend looking at those screens is having an impact on our brain development. 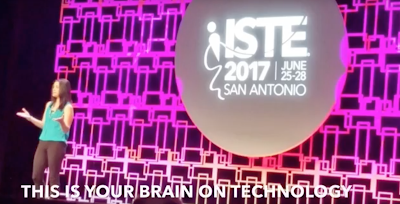 Based on my research into neuroscience and my work every day in schools and classrooms, I put together this Ignite talk (5 minutes total, 20 slides, 15 seconds each) for the 2017 International Society for Technology in Education Conference. It answers many of the questions we have about how much is too much and which uses of technology are worthwhile. How are you incorporating screens in healthy ways at home and in your school? How are you working with all stakeholders – students, teachers, parents, administrators – in your community to establish a clear culture of healthy technology use? The research and testing doesn't stop here. This is just the beginning. 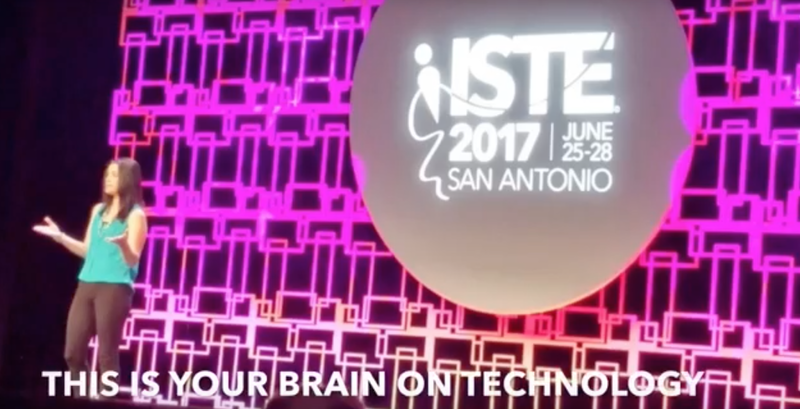 I'm looking forward to learning and sharing more in the coming months, and next year at #ISTE18 in Chicago.